Fremantle Markets was established in 1897..
Fremantle Markets was established in 1897, and throughout the years, has become an iconic tourist destination. Steeped in the port city of Fremantle’s rich indigenous,maritime, convict, colonial and migrant history, the market is one of the most visited places in Western Australia. It is located at the southern end of Fremantle’s ‘Cappuccino Strip’ and housed in a grand Victorian heritage building. This building is one of only two surviving municipal market buildings in Western Australia, and one of the few in Australia that continues to be used for its original purpose. The market building is bounded by Parry Street, South Terrace, William Street and Henderson Street Mall, with several entrances off Henderson Street Mall, South Terrace and Parry Street. Today, this historic building is home to over 150 stalls that hold a fascinating array of wares, people and stories. Walk the Fremantle Markets ‘Heritage Trail’ to explore the unique place the market has in the city’s history. This brochure will help you discover the atmosphere, architecture and tales that lie behind one of the most famous attractions in Fremantle. 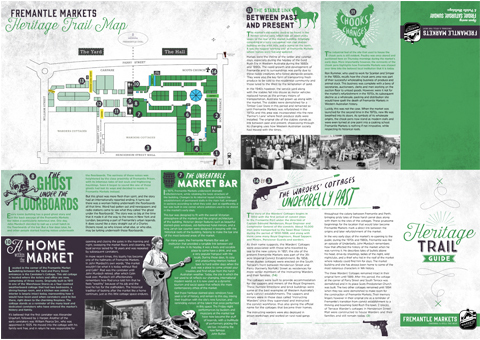 For your easy reference, there is a map Fremantle Markets located on the last page of the brochure.